Popular for her ingenious mashups, Vidya Vox has been creating successful hybrids by mixing the music of leading global artists and has nearly 300 million views on YouTube with more than 3.5 million subscribers on her Vidya Vox channel. Forever 21 is the title sponsor of 'Vidya Vox Kuthu Fire Tour' which will have Vidya Vox performing live across six cities. She will be performing in Delhi on 25th November at JLN Stadium. 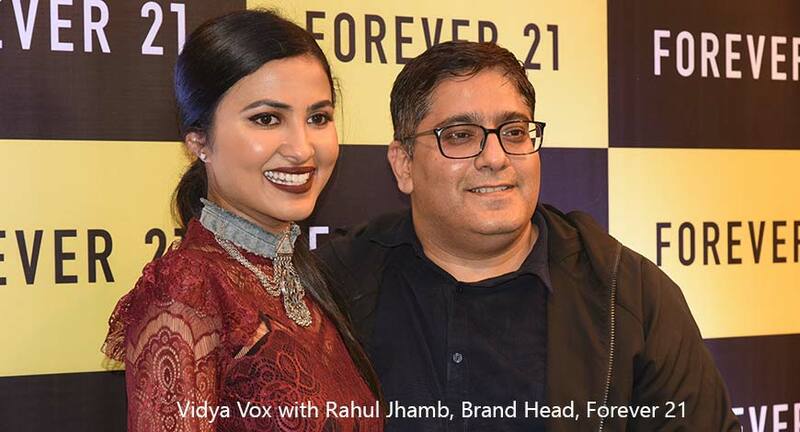 Speaking about this initiative, Rahul Jhamb, Brand Head, Forever 21 said, "We are proud to partner with Vidya Vox and Radio Mirchi for 'Vidya Vox Kuthu Fire Tour'. As an exciting fast-fashion brand from Los Angeles (USA), which has brought new collections in association with budding music stars like Justin Skye, Khaled etc. and music events like Coachella, this association helps us take our consumer engagement a notch higher. Forever 21 is loved worldwide by the young fashionistas, and through this event we provide our consumers with this fantastic opportunity of meeting Vidya Vox in person. Forever 21 believes in providing endearing experiences that resonate with the young audiences and this partnership further reinforces our position as the gen-next brand. At Forever 21, we aspire to make the latest global runway trends accessible to fashion-conscious millennials by introducing new styles every week, thus ensuring that we are the most preferred fashion destination in India". Vidya Vox, added, "I am super excited to be touring with Forever 21 Mirchi Live. A big shout out to my fans in Delhi, I look forward meeting you at Forever 21 store in Bangalore. I do hope you enjoy my concert. I love you all and thank you for all your love and support so far, I'm truly grateful." Forever 21 hosted an exclusive Meet & Greet with Vidya Vox for the top 10 best dressed customers as well as its digital amplification contest "Scream Kuthu Fire", while the first 200 customers received gift cards worth Rs 500 each. Forever 21 also created a special section called the 'Happy Queue' where consumers were entertained with exciting giveaways and games.